And it's fairly common bad logic in many programs. Watching an episode of "Stan Lee's Superhumans" last night I watched as the investigator (what, you think Stan Lee is flying all over the world? He created the Fantastic Four, he gets to put his name on something and that is that) went to England to see if a gent could foresee the future. His reasoning was "Since science hasn't disproved it" this fortune-telling was entirely possible, which made me chuckle, but I was only waiting for the guy who could climb up walls like a monkey anyway so I played MLB: The Show 2010 on my PSP and let him have his way with reality as some guy wrote down vague Nostradamus-like images (the test: where they would drive to the next morning) and then the host did mental backflips proving ways where they might be related to the place the ended up. It was worthy of any psychic but not proof of anything. The monkey-climbing man is Jyothi Rai. He's pretty cool but doesn't claim to use magic or psychic powers to do it. Hope your Hindi is up to snuff. And in "Ghost Lab" a group of real-life Ghostbusters get teary-eyed because they want to believe some waveform filtered noise is John Wilkes Booth. Ridiculing this show means I will never get a job on Discovery Channel - though Phil Plait did, and he is among the most famous skeptics in the world, so I guess I should say it reduces my chances. But that's just highly-paid goofballs messing around in a lab. In North Carolina, a ghost hunter looking for a ghost train got hit by a real one. He didn't find a ghost but he now has the opportunity to become one. 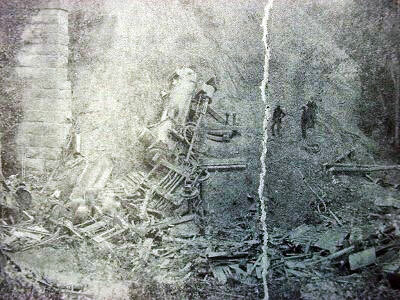 You see, on August 27th, 1891 a train wreck occurred near Statesville, NC and killed 20 people and local legend among the more gullible since then has been that the train is still trying to deliver the mail or whatever. So last night 12 amateur ghost hunters got together to have a ghost train viewing and one unlucky person did not clear the tracks in time when the actual train came along. What I am not sure I understand is, when the Columbine shootings occurred, anti-gun zealots insisted it was the video game "Doom" or the NRA or whatever. Who is going to blame shows like "Ghost Lab" for turning young minds into mush? Well, no one, because it is complete idiocy. I'd take my kids out camping and build a campfire and tell ghost stories and keep them up as late as they want looking for a ghost train, because it's fun. What I wouldn't do is confuse pseudoscience with real science and a ghost train with an actual one barreling toward me. (1) But don't get me wrong, if that house in Amityville goes up for sale, I am not buying it regardless of my disbelief in it being haunted. Doing punditry from afar, I can be part of the salacious media ridiculing the idea of ghosts but my wife waking me up to 'investigate' every noise in the house each night would be very, very real.